Hei og god Mandag kveld♥. den i brunt, da jeg synes at det er en farge man godt kan bruke som julefarge. og hun har jeg fargelagt med Copics. en del av deres Design Team i 2013, og selvfølgelig vil jeg det:-). og bli med på utfordringen. I have been asked to be a part of the Design Team over at Stamp with fun. My first posting will be in January. Be sure to follow me then and join the challenges. Thank you so much for visiting my blog♥. Superlækker gavepose du har lavet, det ser rigtig flot ud med den punchede kant du har øverst og Tilda er lækker som altid, nydelig farvelægning. Tillykke med dit nye 'job', jeg elsker sketcheudfordringer, så.... vi ses! Tak for du deltager hos ABC Christmas Challenge denne gang. Ønsker deg ei fin førjulstid! Awesome ! I love the colors on the bag and your image is colored beautifully. Thanks for joining in at Card Makin Mamas. This is so gorgeous sweetie. I adore the colours and your layout is awesome. Gorgeous gift bag, very pretty design and lovely image. Thank you for sharing your work with all of us at Crafty Boots Challenges. 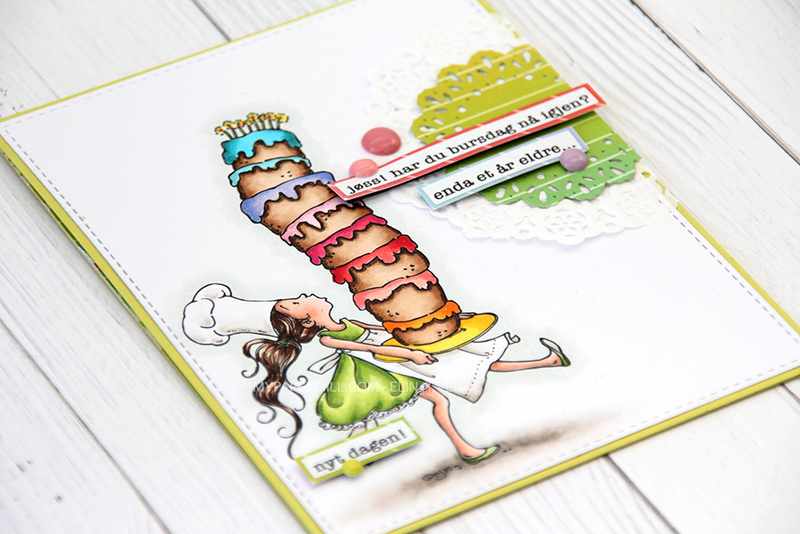 Hi there, awww such a sweet image and a lovely project - great colour choices. Gorgeous gift bag Marita :-) Tilda is lovely and all the details are absolutely fabulous !! Absolutely stunning. The colouring is so skilled and the coour choices are beautiful and absolutely perfect. Thank you for joining us at Artistic Inspirations.. Gorgeous!!! Thank you for joining us over at Cards Galore this month. Aww this is really sweet Marita… what a cute Tilda image and your colouring is fab! it's a wonderful design! Hope you and your family have a Happy and Healthy Christmas and New Year! Fantastisk flott gavepose i så lekre farger! Your colouring is just amazing. I love that oval nestie too. Hope Santa brings you lots of crafting goodies! Your bag is so beautiful! I love the colours, especially the flowers! And your colouring of sweet Tilda is so good! Thank you for joining in at Dream Valley.